Following Expressions of Interest for the Bruce Highway Upgrade-Caloundra Road to Sunshine Mwy, SCEC understands two proponents have been selected to progress into the competitive design phase. Now subject to commercial-in-confidence, emphasis has been given by Transport & Main Roads to 'minimise' the impact on the Steve Irwin Way Forest. While it's encouraging and absolutely necessary such a significant factor is incorporated into the preparation of the final design, avoidance of the forest is really the only way impact will be minimised. An improved design for better conservation outcomes overall is imperative. 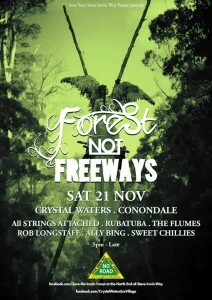 To keep the momentum for the forest going, join in the 'Forest Not Freeways' event on Sat 21 November. It's a great line up for a great cause!